Don't just hope that people visit your site. Take charge of your sales with effective marketing campaigns. We'll find what's causing your online reputation to take a hit. We can then develop an in-depth plan to increase your brand's sentiment and rebuild it's reputation. Our team will make your conversions our priority. We'll start by optimizing your website and putting together a comprehensive plan to convert more leads into customers. Let us take control of your social media and digital marketing platforms. We'll analyze your past results and put together a plan to help your business convert social media traffic. Take Charge of Your Inbound Marketing! One Click Marketing provides custom marketing campaigns primarily to small and medium financial services companies. Our clients range from bankruptcy attorneys to installment lenders to investment advisers. We are Google Adwords certified & Bing Ads Accredited Professionals. We can help your company with all phases of SEO and PPC. Local search is your most important advertising strategy. Implement an effective local search strategy that maximizes your regional footprint. Use Google Maps for local search campaigns. An effective mapping strategy will ensure a successful local acquisition plan. It's important to know how to build links organically. SEO plans must be done correctly to ensure a long term marketing strategy. Use PPC for your inbound lead pipeline. 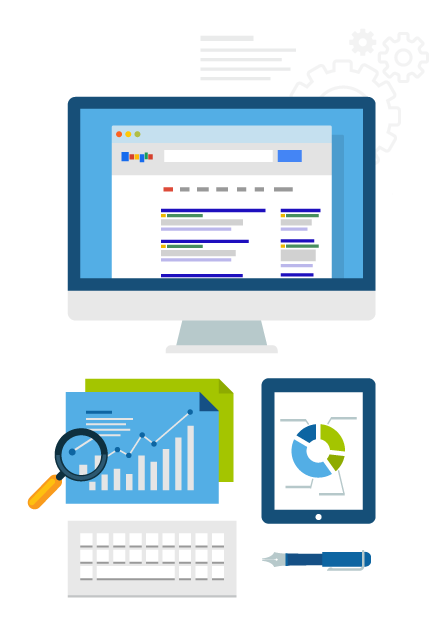 Implement a successful PPC campaign that maximizes profit on Google Adwords & Bing. We will design a high end landing page that conveys your message and helps the consumer to better understand the value of your product. Email is still a viable marketing plan. Effective and transparent email marketing campaigns that deliver your message to consumers.